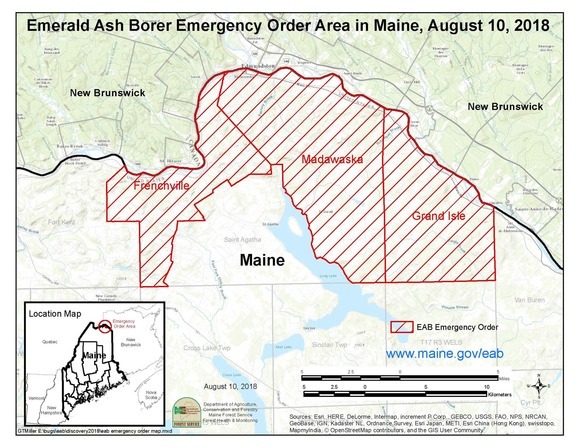 AUGUSTA - The Maine Department of Agriculture, Conservation and Forestry's (DACF) Bureau of Forestry Director has issued an Emergency Order to Stop Movement of Ash in response to the detection of emerald ash borer (EAB) in northern Aroostook County. The Emergency Order restricts the movement of certain ash (Fraxinus spp.) products and any untreated firewood from emerald ash borer (EAB) infested towns in Maine. Current Order Area Towns: Frenchville, Grand Isle and Madawaska, Aroostook County, Maine. To protect the ash resources of the state of Maine from the unrestricted spread and establishment of a dangerous tree-killing forest pest, the Director of the Maine Bureau of Forestry has taken action and issued the Order pursuant to authority granted by 12 M.R.S. § 8305. The full text of the order is available on the Department's EAB information page: www.maine.gov/eab. The emerald ash borer is a highly destructive, introduced pest of forest and ornamental ash trees (Fraxinus spp.). Since its initial detection in southeastern Michigan near Detroit in the summer of 2002 it has spread rapidly. As of August 2018, it has been found in 35 states, and 4 Canadian provinces. Ash trees infested with EAB may die within two to three years. From 2002 to 2018, EAB has killed hundreds of millions of ash trees in infested states and provinces, and has cost municipalities, property owners, nursery operators and forest products industries hundreds of millions of dollars. In response to the significant ecological and economic threat posed by EAB, Canada and the state of Michigan established EAB quarantines in 2002. In 2003, the United States Department of Agriculture—Animal and Plant Health Inspection Service (USDA-APHIS) established a federal quarantine to restrict movement of potentially infested material. The emerald ash borer; firewood of all hardwood (non-coniferous) species; nursery stock, green lumber, and other material living, dead, cut, or fallen, including logs, stumps, roots, branches, and composted and uncomposted chips of the genus Fraxinus. Unless infested states restrict internal movement of potentially infested ash material, the federal government will designate the entire state as a quarantined area, which designation will subject the state to federal regulations restricting interstate and international commerce of ash material. In late May 2018, an established EAB infestation was detected in Edmundston, New Brunswick, Canada, approximately 500 yards from the Maine border (www.maine.gov/eab). Subsequent multi-agency surveys detected lightly-infested ash trees in Maine immediately across the river from the Edmundston infestation. The infested ash trees were located in Madawaska, immediately adjacent to the Frenchville town line. In early-August purple trap surveys revealed that EAB is also established in the town of Grand Isle. The detected infestation in Maine is very light and covers only a small area. If immediate steps are not taken to contain the infestation, however, this infestation will spread. Following the initial detection, the Department of Agriculture, Conservation and Forestry (DACF), Bureau of Forestry, also known as the Maine Forest Service (MFS), reached out to all contacts on active commercial timber harvest operations, firewood dealers, and nursery and plant sellers within Madawaska and Frenchville and apprised them of the situation. The DACF also notified local municipal officials and legislators. The DACF held a meeting in Frenchville to discuss the implications of the situation with local residents and businesses. At this meeting, and in subsequent correspondence and media coverage, the DACF informed residents that a stop movement order was planned for early August after the MFS conducted additional delimitation surveys and sought additional comments. Ash trees comprise 4 percent of Maine’s hardwood forest, are a valuable timber species, and are also an important street tree. EAB threatens all species of ash trees (except mountain ash) and could have significant ecological and economic impacts on the state. There are no practical means to control EAB in forested areas, though pesticide treatments can protect individual trees. To assist wood processors in complying with the order requirements, the MFS will provide a list through e-mail distribution of active forest operations within the order area. Requests to be added to this list should be directed to forestinfo@maine.gov. An informational meeting on Emerald Ash Borer is planned in northern Aroostook County for August 23, 2018 @ 6:30 pm, location TBD. Parties interested in receiving updates regarding emerald ash borer in Maine can subscribe to the Department’s electronic bulletin list "Emerald Ash Borer (EAB)." Subscriptions are available through e-mail or text message (SMS) at https://public.govdelivery.com/accounts/MEDACF/subscriber/new.